Molly's Country Memories: Baby shoe ornies..
Good morning pretty ladies, I am so proud of myself, I actually got a little painting done this week. Would have gotten more done, but we had a dear friend who passed Monday and we had to attend the wake and then Dr D. called and said my parcial had come in so I had to go to his office today to pick it up. Needless to say after 8 days with out it I was very happy to pay him a visit. I had hoped to get both of them done but only got one finished. click on pictures to get a good look at the painting. I added sheer pink ribbon for the laces and taking an ice pick made a hole in the top of the back and added a hang loop out of the same sheer ribbon. Painted the child,s name and the year on the bottom and I'm thinking about adding miniture dolls and Teddies or packages in the opening to make it look like a mini stocking hanging on the tree. Well what do you think..does it look ok, or silly.. I am posting this on D Dzines....where DeeDee is hosting Art work Friday. Be sure and stop by and check out all the lovely paints and finished for Friday items. Oh I love them! What a cute idea. I like the idea of adding tiny teddies so it looks like a little gift. You're so talented! 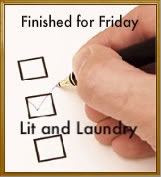 Thanks for linking up to Finished for Friday. Molly, How darling, you are very creative. ZI am sure what ever you decide to do will be great. I just love them! Your creativity never ceases to amaze me! You are gifted beyond words! I would have never had your fantastic vision for a baby's shoe! Love your new header photo! Awesome. Love your work. Would have never seen it looking at them on a shelf. You are indeed very talented! What in the world? Love, love these!!! This makes me wish I had saved my baby's shoes! I actually do have the baby shoes I wore but I just leave them as they are! These are adorable! I love the idea of filling them so they look like stockings. You are talented! Just charming, Molly, and I'm so glad to know who they were made for, and think how much they will enjoy them for always. Just think---in a few decades, they'll be family antiques, with the story of Grandma Molly's talents and coveted artwork spilling down the generations with pride and happiness. Oh Molly, your mind just teems with creative ideas...what a darling idea. I love the idea of the teddies added...the ribbon for laces is so pretty! Very cute! Would have never thought of creating such a darling ornament! Those shoes are very cute. Since babies outgrow them so quickly, I think you could paint them for a child to actually wear... snowmen for winter or flowers for summer. Not sure if the paint could stand the wear and tear though, but mothers and grandmothers would think them adorable. Your tiny work amazes me... painting details on small things isn't easy. Those are so cute Molly! 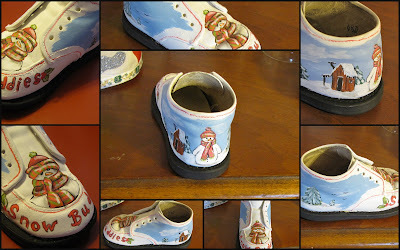 I would have never thought about using a shoe for a Christmas ornament but that really does look great! What do I think? Well, I think that you are a genius! Those are so sweet. I've never seen anything like them. Very nice. They are so cute!! You have done a great job!! I think they are adorable, Molly!